A sudden and surprising desire to perform carpentry meant that Monday was spent weather boarding the gable end of the house. Back at home with numerous DIY stores just down the road this would present no real challenge but on an island where the nearest shop is a good hour or so away? Not so much. Fortunately over many years a policy of never throwing anything away, just in case, meant that we already had a wide array of materials from which to choose including left overs from the last major building work here and tongue and groove panelling which once adorned the front sitting room. Re-purposed these materials seemed to take to their new life almost too well, although the lack of a working drill did increase assembly effort somewhat. With one success under our belts there was no stopping us and a long missing section of guttering was quickly erected, again from recycled materials, doing our green credentials no end of good. Of course all this construction work meant that our birding efforts for the day were rather limited. In the end all we could manage were four Golden Eagles soaring together up behind the house and our first Yellowhammer on the feeders this trip. It’s a hard life but someone has to do it. We all caught a bit of sun thanks to being outside for much of the day which made it all the more surprising to wake up to snow this morning. Yes, actual snow, here on the west coast in April. What was that I was saying about our bonkers weather of late? 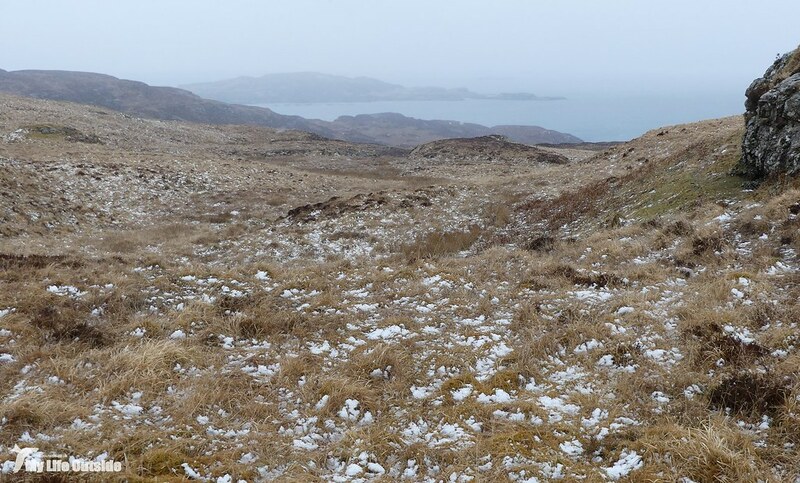 Admittedly it was only a light dusting here but inland the hills were white over and we continued to enjoy blizzard conditions for much of the day. It wasn’t really walking weather but I couldn’t resist getting out with the camera to capture this unusual, at least in recent years, event. 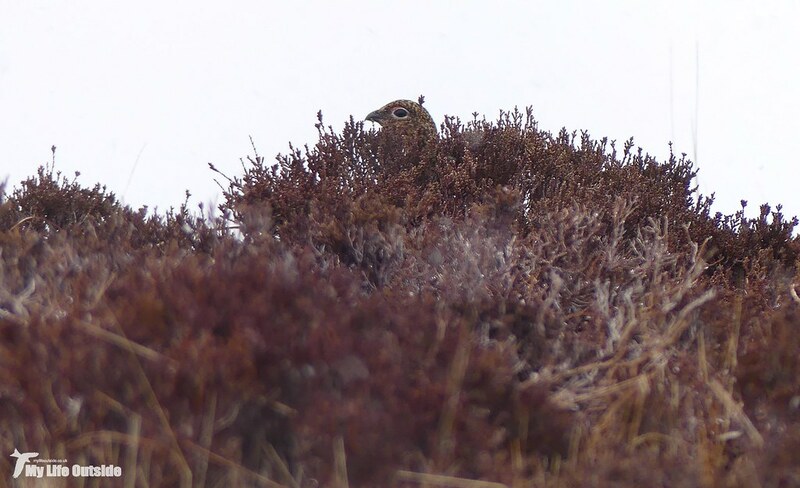 What I hadn’t expected to find were two members of Mull’s elusive Red Grouse population hunkered down just the other side of an eight foot deer fence, red eyebrows flaring in a blatant disregard for any attempt at camouflage. 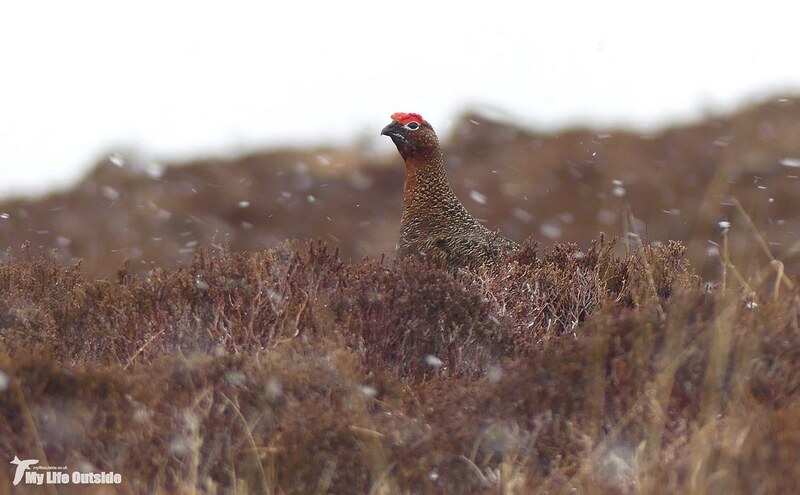 For the briefest of moments I toyed with letting the moment pass but grouse in snow? I couldn’t resist and had soon hopped (with some degree of difficulty) the fence and was left considerably damper but very happy with the results. 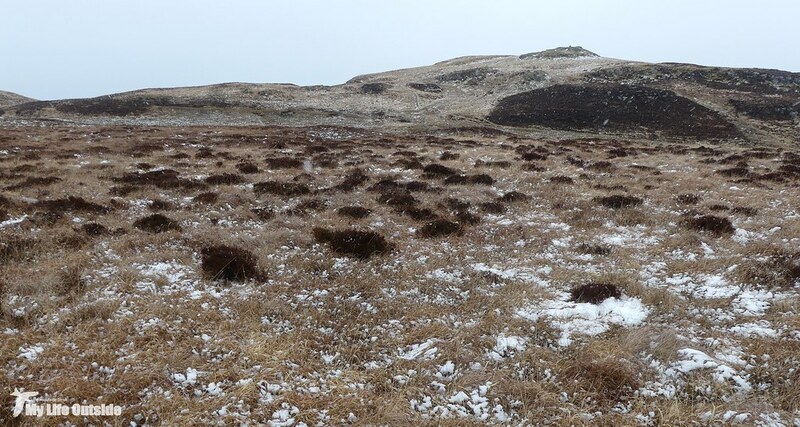 By late afternoon the snow had vanished from even the hills replaced instead with a horrible combination of sleet and freezing rain. That someone could suggest a walk at Calgary therefore was baffling but it was good to get some fresh air and had the added bonus of a superb summer plumaged Great Northern Diver just off shore. There was also the welcome arrival of three male Wheatears, all new in and presumably wondering if they hadn’t made some terrible miscalculation. I mean really, all the way from Africa to summer in this? 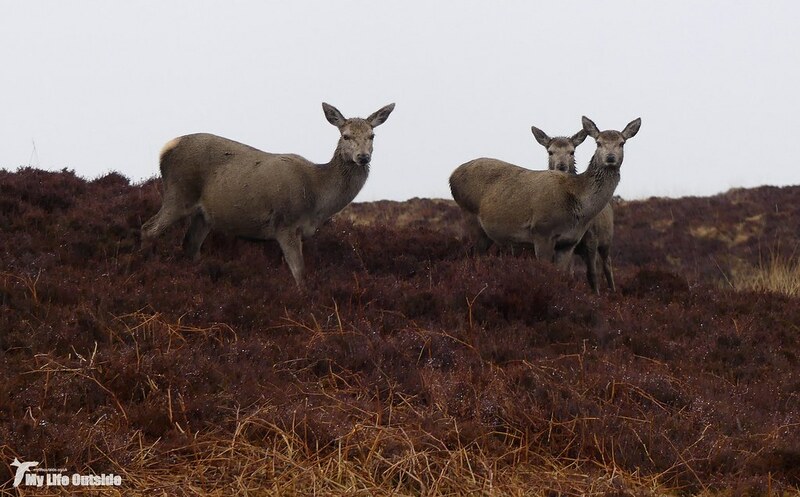 On the drive back we passed a small herd of Red Deer hinds, inside the aforementioned deer fence designed to keep them out it has to be said, who posed nicely for a photo before trotting off up the hill. As I sit here writing this now the sun has set but the wind continues to howl and precipitation, in all its various forms, shows no real sign of abating. Thankfully tomorrow’s forecast looks a little more promising which is a very good thing indeed as I’m itching to get back out walking once more.